On 2 December 1818 a funeral was held in St George’s Chapel for Queen Charlotte, who had died on 17 November. The Queen was buried in the new Royal Vault in St George’s, which had been commissioned in 1804 by her husband, King George III. 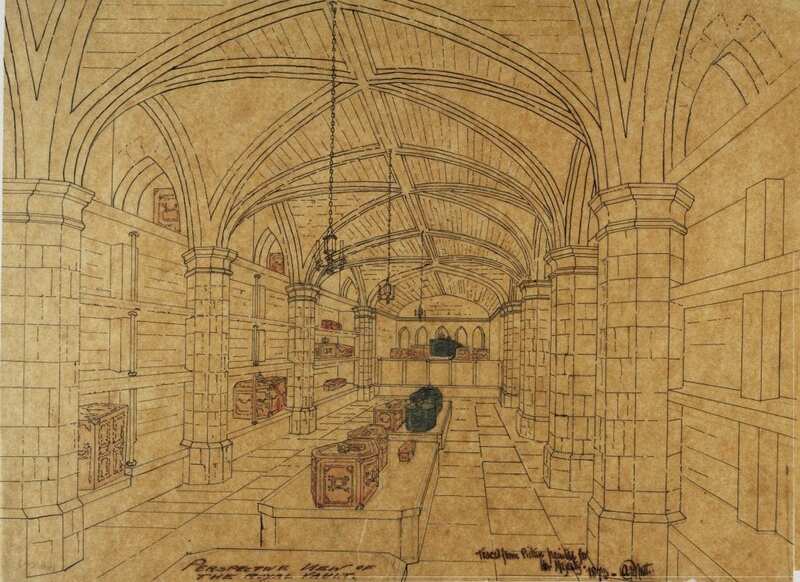 This image of the Royal Vault was completed by Alfred Young Nutt, surveyor at the Chapel, in 1849. It shows the vault as it would have originally appeared. Alterations were made at the end of the nineteenth century and the coffins were moved and stripped of their older velvet coverings and refitted with new polished oak and ironwork. Born on 19 May 1744 and raised in a small court in northern Germany, Sophia Charlotte of the House of Mecklenburg-Strelitz married George III on 8 September 1761 at the age of 17, becoming Queen of Great Britain. The King and Queen lived and ruled through over half a century of world events, including the Seven Years War, the establishment of the British Empire in India, the American War of Independence, The French Revolution and the Napoleonic Wars. Throughout their reign, George III, Queen Charlotte and their large family firmly established Windsor their home. In commissioning the Royal Vault they also made it their final resting place. Their youngest daughter Princess Amelia died in November 1810 and her funeral was held in St George’s Chapel, but the Royal Vault was then unfinished. Architect James Wyatt was in the process of constructing a corridor from the present altar and a vault under the oldest section of the Chapel (the Tomb House, or Lady Chapel, which was later converted by Queen Victoria into the Albert Memorial Chapel). The Royal Vault was a feat of engineering and was modelled upon the layout of the Hanoverian Royal Vault in Westminster. Wyatt and his nephew Jeffry successfully constructed the largest private burial vault in England at the time, with a subterranean corridor and a vault platform entrance in the floor of the quire, capable of descending slowly through mechanisation. Princess Amelia’s remains were transferred when the vault was completed in 1810. They were later followed by those of Augusta Duchess of Brunswick (the king’s sister) in 1813 and of the king and queen’s granddaughter, Princess Charlotte of Wales, and her stillborn son after their tragic death in November 1817. Queen Charlotte passed away on 17 November 1818 and her body was laid privately in State at Kew Palace, where she had spent the last few days of her life. 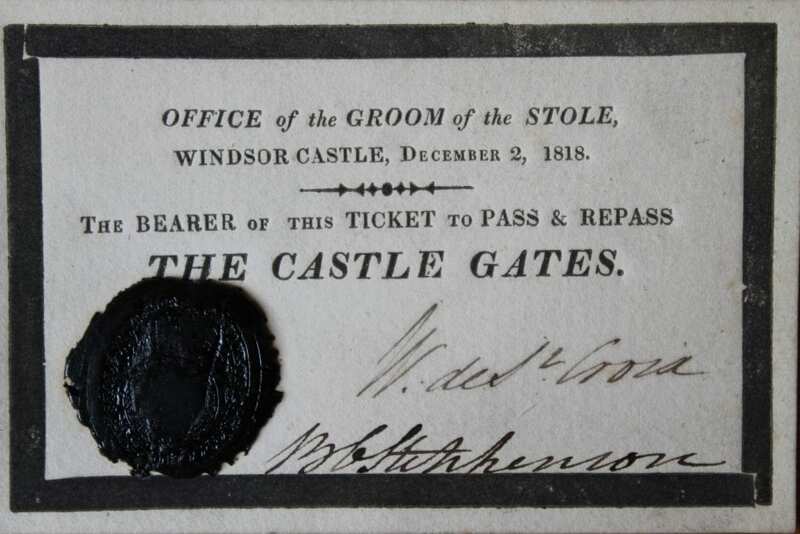 She was moved to Windsor on Wednesday 2 December 1818, the day of the funeral service, which took place at 8.00 p.m. The hearse which carried Her late Majesty was adorned with ten escutcheons and drawn by eight horses. It stopped at Frogmore to receive a procession, including the Princes of the Blood Royal. The King was not in attendance due to his long-standing illness; the Prince of Wales was, at this time, Prince Regent. Only 54 members of the general public were admitted to the funeral, along with forty Yeomen, the Knights of the Garter and others close to the Royal Family. The Queen, King and Prince Regent’s Apothecaries, Physicians and Surgeons were all present. As were the Ladies of the Bed Chamber, Keeper of Robes, and other attendants of the late Queen [X.33/50]. It was reported afterwards that the Choir performed beautifully and the Dean of St George’s Chapel, the Hon. Henry Hobart, read the burial service “in a most impressive manner”. At twenty-five minutes past nine, as the choir sang, the platform bearing the coffin was gradually lowered by what the New Monthly Magazine called “imperceptible machinery” [CL 12].